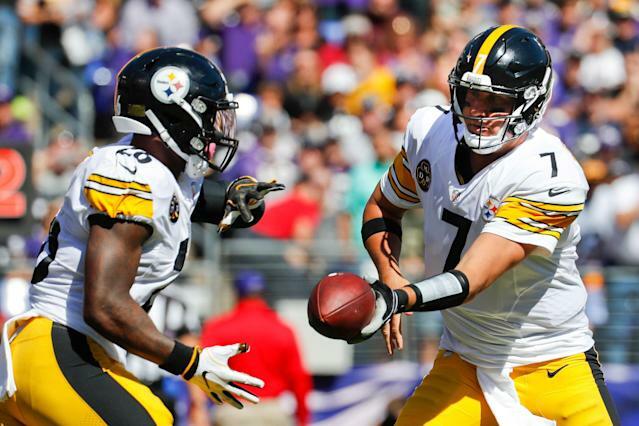 It’s probably not a surprise to hear, since Pittsburgh Steelers general manager Kevin Colbert is on the record as saying he doesn’t have a problem with quarterback Ben Roethlisberger publicly throwing other players under the bus, but now-departed Le’Veon Bell says Roethlisberger doesn’t see teammates as equals. On Wednesday, “Sports Illustrated” posted a story by Jenny Vrentas along with a video of Vrentas interviewing Bell for a cover story. Bell signed a four-year, $52.5 million contract with the New York Jets last week, after sitting out the entire 2018 season. The Steelers had used the franchise tender on Bell for the second straight year, and rather than take on the wear and tear — and risk significant injury — of another 400-touch season without a multi-year deal that offered a good chunk of guaranteed money, he stayed home. Bell decided it was time for a fresh start, and agreed with other former Steelers, Antonio Brown and Josh Harris, who have pointed to Roethlisberger as a source of frustration. He added that he wishes he and Roethlisberger had “a more open, more genuine, more real” relationship, and that players didn’t feel like Roethlisberger treated other players as being on the same level as him. Bell went on to say that Roethlisberger is a great quarterback, but allows his personal preferences to guide his play. “The organization wants to win. [Coach Mike] Tomlin wants to win. Ben wants to win — but Ben wants to win his way, and that’s tough to play with,” Bell said. “Ben won a Super Bowl, but he won when he was younger. Now he’s at this stage where he tries to control everything and [team brass] let him get there. Bell, of course, has heard from those who think he should have taken what the Steelers offered — their final multi-year offer was five years, $70 million, but the only fully guaranteed money was a $10 million signing bonus (the Steelers don’t offer future guarantees in veteran deals). Bell would have received $33 million over the first two seasons, which he almost certainly would have seen. But in the end he chose the Jets, a team long rumored to be one of his top suitors, and received $25 million fully guaranteed, the most ever for a running back. There are also escalators that can put more money in his coffers. Bell says he was a Jets fan as a kid because he loved Hall of Fame running back Curtis Martin.